Welcome to CloudCheckr Partner Webinars—where comprehensive cloud management meets a managed service provider to help you recognize the full potential of cloud infrastructure as a service. 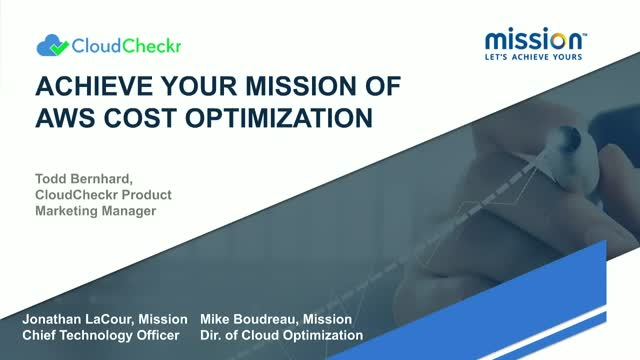 In this webinar, CloudCheckr joins forces with Mission (the combination of Reliam, G2, and Stratalux) to cover the basics and best practices of Amazon Web Services cost optimization. Webinar attendees will learn how to identify common cloud spend wastes on unused and unattached resources, instance right-sizing, up or down, or across families based on utilization, and how to create significant savings with Reserved Instance purchases. The promise of the cloud was to pay for only what you use. The reality is you pay for what you order, whether you use it or not. Let Mission, a leading AWS managed services and consulting partner, help you achieve your mission and if that means saving on the cloud, this webinar has got you covered. Since the adoption of public cloud services, IT infrastructures have become dynamic and complex environments. Now, users can spin up new cloud resources in seconds, and make snap decisions on instance types, storage types, and payment mechanisms. And while scalable and reliable, these new processes present a challenge. Individuals can mistakenly enable services that result in huge surprise AWS bills, or forget about an oversized Azure or AWS instance and end up paying for it month after month. Cloud cost optimization is the process of adjusting your monthly cloud usage based on a set of cost-saving best practices. Some of these best practices include rightsizing instances to scale, and eliminating underused resources. Hear from the experts at CloudCheckr and N2WS/Veeam to learn more about “Cloud Pricing and Cost Optimization: How to Avoid Unexpected Fees"
SPECIAL GIVEAWAY: The first 100 live attendees will receive $50 AWS credit, courtesy of N2WS/Veeam. MSPs, CSPs, and Resellers are often looking for ways to lower costs, increase profit margins and continue to add value to their clients. CloudCheckr is purpose-built to help with all of the above. In this webinar, attendees will learn how to use CloudCheckr to add custom charges, keep or distribute discounts and credits, generate invoices automatically, analyze profits, and customize their white label interface. CloudCheckr is a robust Cloud Management Platform that, in addition to Billing & Invoicing, delivers Cost Optimization, Security & Compliance, and Automation capabilities. Look for our other tutorials on those topics. If you've outgrown the capabilities of CloudHealth and are making the switch to CloudCheckr, this educational webinar will translate the comparable functions and reports from CloudHealth to CloudCheckr. Additionally, attendees will be introduced to numerous features not available to CloudHealth users such as Total Compliance, SnapBack, Automation, White Labeling and more. This webinar is the "Rosetta Stone" to help you make the transition for the better. Unlike in the Data Center, where an enterprise had complete responsibility for security, the Cloud is different. There is a Shared Responsibility Model. Cloud providers like Amazon Web Services, Microsoft Azure and Google Cloud take responsibility for items under their control, but customers must secure their data and applications. Fortunately, there are hundreds of Best Practice Checks provided by CloudCheckr, that can help automate this. Additionally, those checks are mapped to compliance standards and CloudCheckr's Total Compliance scores an organization according to 35 distinct regulations including CIS, HIPAA, PCI DSS, NIST and more. Just because an enterprise achieves a level of compliance, that doesn't guarantee it will stay there. CloucCheckr's Change Monitoring, combined with Custom Alerts, can help keep a cloud secure. Attendees will learn how CloudCheckr's 550+ Best Practice Checks can help, including automation via Fix Now, Always Fix and Request Fix. CloudCheckr is a robust Cloud Management Platform that, in addition to Security & Compliance, delivers Cost Optimization, Automation, and Invoicing capabilities. Look for our other tutorials on those topics. Achieving cloud compliance in a given industry requires a thorough, risk-based approach. And it's possible with the right strategy. It is important to be aware—and cautious—of the way data protection laws vary between states, countries, and government bodies. In healthcare, HITRUST and HIPAA cloud compliance is highly desirable as most payers will only work with HITRUST certified vendors today. Analysts predict the majority of providers will follow suit within two years. Earning certifications like HIPAA Compliance on Amazon Web Service (AWS) can give your organization a competitive edge. Learn how to earn AWS compliance certifications easily with the security strategies and best practices covered in this webinar. CloudCheckr Product Marketing Manager Todd Bernhard, and Cloudticity Founder and CEO Gerry Miller, discuss ways to leverage technology, automation, and cloud economics to achieve compliance while reducing costs and ongoing maintenance requirements. The promise of Cloud Computing is ideal... pay for what you use, and not a penny more. The reality is that you pay for what you order, whether you use it or not. Gartner estimates that enterprises overspend on the cloud by as much as 70%. Many times, they use Data Center mentality in the cloud, or they don't take advantage of long-term commitment discounts, or they have users who turn on services and forget about them. In this live tutorial, we will demonstrate how CloudCheckr can help reduce costs, often by 30% or more, by identifying idle, unused and unattached resources and through Right Sizing and purchase recommendations for reserved instances. CloudCheckr is a robust Cloud Management Platform that, in addition to Cost Optimization, provides Security & Compliance, Automation, and Invoicing capabilities. Look for our other tutorials on those topics. Tax season is here and that means hackers will be targeting financial institution, looking for particularly sensitive personal information such as social security numbers, salaries, marital status, street addresses, birthdates and more. This information needs to be protected year-round, but there's no time like the present. In this webinar, attendees will learn about the differences in cloud computing versus the data center, especially areas of responsibility and vulnerabilities that need to be addressed including S3 and Blob storage container permissions, Identity and Access Management concerns, Encryption and more. Finally, we will discuss recent security breaches that could have been prevented. using the Security, Compliance and Auditing features of CloudCheckr. The financial services industry is increasingly using cloud services for business-critical operations. But how do you keep cloud data secure? Join this webinar where we’ll cover what leading finserv organizations do to manage risk in the cloud, their best practice for security and compliance with federally regulated requirements, and strategies to minimize data breaches in the cloud. Experts from CloudCheckr—the largest independent cloud management SaaS application for cost, security, and compliance—and Amazon Web Services (AWS) managed service partner JHC Technology, will lead the webinar discussion. Just as traditional Managed Service Providers (MSP) businesses are evolving with the rapid adoption of the cloud, the Amazon Web Services (AWS) MSP Partner Program criteria is always changing. The program recognizes highly skilled AWS Partner Network (APN) Consulting Partners that provide full lifecycle solutions to customers. AWS recently released Version 4.0 of its Validation Checklist, and is requiring all APN Partners to meet requirements by April 1, 2019. Achieving AWS MSP Partner Program Validation is possible and easy with the right preparation. In this webinar, attendees will hear a summary of the new requirements, how CloudCheckr helps MSPs meet those checklist items, and areas where MSPs can increase cloud growth and profit going forward. In the rapidly growing, ever-changing cloud computing industry, Cloud Solution Providers (CSPs) are discovering a major challenge: How do we add value and enhance our service offerings, while also increasing margins to ensure profitability? Robust cloud solutions are necessary to stand out and solve for customer pain points. However, it can be difficult to find the right partners to integrate into your platform. Join Microsoft Azure Cloud Solutions Architect, Rob Kuehfus, and CloudCheckr's in-house Azure experts to explore common challenges facing CSPs today, and how to solve them with a comprehensive, independent Cloud Management Platform. Not only will attendees learn the specific tools offered by CloudCheckr for Azure, but they will also learn how to increase margins and profitability with our offering. Our experts will cover cost optimization, leveraging Reserved Instances, and following Security Best Practices that go above and beyond Azure Advisor and Azure Security Center. Additionally, how CloudCheckr helps you track Office365 licenses and integrate with Azure Active Directory, and how to use CloudCheckr to generate invoices automatically, including custom charges as desired. Whether you know it or not, you are likely utilizing cloud computing in your day-to-day life. From storing and sharing hundreds of photos and videos on your phone, to deploying high-priority workloads in a massive enterprise organization; cloud computing offers a fast, flexible, and economically viable option for delivering computing services over the Internet. The benefits of cloud computing are constantly growing as new functionalities are released daily by major cloud services providers, namely, Amazon Web Services (AWS), Microsoft Azure, and Google Cloud Platform (GCP). In this complimentary webinar, we will review the top ten reasons for adopting a cloud-first infrastructure in medium-to-large enterprises, managed services, and public sector organizations. Key takeaways from this session include an understanding of cloud computing, shared responsibility related to public cloud security, how to optimize cloud spend, and why cloud management is essential while using AWS, Microsoft Azure, and GCP. All organizations considering building a cloud-native architecture must leverage this knowledge to properly prepare for the future. From the brand new CloudCheckr Success Center, to new user-friendly product features, CloudCheckr has a variety of new tools to help manage your cloud infrastructure. The CloudCheckr Success Center folds our traditional support site into a new platform, with training videos, helpful guides, and a shared library of code samples. Our app is now easier than ever to use efficiently, especially for power users, thanks to multi-select dropdown filters. Our application remains up-to-date as our cloud partners, like Amazon Web Services (AWS) and Microsoft Azure, continue to announce support for new instance types and regions. Plus, we’ve made your auditors happy with our SnapBack™ feature, which gives you up to seven years or historical reports. And by comparison, our competitors only offer two-to-three months. Watch this webinar to learn the details on CloudCheckr's latest updates and easy-to-use functions. Properly managing cloud resources is one of the most effective ways to reduce complexity and lower your monthly cloud spend. Yet, maintaining accountability across an ephemeral IaaS infrastructure can be a challenge for Finance and DevOps teams. With the proper tagging strategy and implementation, organizations will be able to manage cloud costs around their EC2 instances and resources. Additionally, individuals can operate an easy-to-use tagging system to create invoices in just minutes. Join CloudCheckr for a webinar discussing proactive tactics and tips to execute an AWS and Azure multi-cloud tagging strategy as your organization scales, including common use cases, homogenizing tagging structures to save time and avoid confusion, tagging best practices, and tagging enforcement policies. Join this one-on-one interview with Gerry Fassig, VP of Cloud at CoreSite , for an in-depth discussion on how hyperconnected data centers can transform enterprise IT. - What are the drivers for hyperconnected data centers? - How is cloud, interconnection and direct connectivity influencing CoreSite's strategy? - How important are the public cloud providers in the development of hyperconnected data centers? - What makes a true hyperconnected data center and in what way can it transform enterprise IT? The Public Cloud may be new to many enterprises, but it has been around long enough for Best Practices to have been established. As organizations migrate to the cloud, they do not have to start from scratch. They can leverage policies, or frameworks, established by cloud gurus and avoid repeating the mistakes of the early adopters. It is also important to get buy-in from different departments, so establishing a Cloud Center of Excellence is highly recommended. Attendees of this CloudCheckr webinar will learn what a Cloud Center of Excellence (CCoE) is and who should participate in one. They will also understand the pillars of the AWS Well-Architected Framework (WAF) and discover how CloudCheckr can help establish both a CCoE and WAF. Modern enterprises are embracing the cloud primarily as a way to save money. But just as “Server Sprawl” was a problem with data centers, Cloud Sprawl can quickly become a concern. Without Cloud Cost Management, running a constantly growing and evolving set of public cloud services in a dynamic environment can easily get out of hand. In an ephemeral environment, resources can easily become under-utilized or wasted—negating any potential cost savings in the cloud. To further complicate the cost of the cloud, instances can be purchased at different rates, depending on how and when they are used. When left to individuals across different departments, teams, and business units, purchase decisions are less than optimal. Your organization needs to stay safe as you grow—which is why a comprehensive cloud platform should unify cost and security management. In this webinar featuring Pinnacle Technology Partners, attendees will learn about the risks involved with poor visibility and lack of control in AWS and Microsoft Azure, RI Purchasing and Right-sizing Recommendations, and why AWS and Azure perform better with Cloud Management tools. Welcome to CloudCheckr Partner Webinars—where comprehensive cloud management meets managed services to recognize the full potential of cloud infrastructure as a service. You’ll want to attend this webinar with Josh Bouk, Cass Information Systems Vice President of Sales and Marketing, and CloudCheckr Cloud Management Expert, Todd Bernhard. Together Josh and Todd will show you how to reduce your cloud spend by 30%, while actually increasing cloud adoption in your organization. Takeaways from the webinar include best practices for accurate allocation and chargeback/showback to your cost centers and business units. Adoption of public cloud providers has transformed the way companies manage their IT infrastructure. Enterprise IT is no longer built on fixed, up-front capital expenses. Dynamic, elastic environments that require daily management to keep operations at scale are the norm. Discover enterprise cloud management services on this CloudCheckr Partner Webinar. MSPs, CSPs, and resellers often have a tough enough time generating invoices for their customers. Add to that the demands of a multi-cloud environment, with AWS, Azure, Google Cloud and more, and it becomes extremely challenging to allocate billing and invoicing. The solution is automation and self-healing. CloudCheckr can automatically generate invoices and even help resellers profit by keeping discounts and credits allocated among clients, presenting list price, as well as custom charges and credits as desired. Of course, there are no such things as monsters. But Zombies (unattached, unused, and idle resources), Giants (wrong-sized resources), and Vampire Blood Suckers (expensive on-demand instances) are a very real cloud infrastructure nightmare. Avoid these security and costly cloud scares. Join this Halloween-themed webinar to learn how to banish the Zombies, Giants, Vampires, and other scary cloud monsters from your Amazon Web Services (AWS), Microsoft Azure, and Google Cloud infrastructure. We are cloud management on AWS, Microsoft Azure, and Google Cloud. We are comprehensive cloud management for modern enterprises, services providers, and the public sector. CloudCheckr software enables clients to optimize costs, security, and compliance, effectively managing their multi-cloud ecosystems from a unified view. With 550+ Best Practice Checks, CloudCheckr simplifies the way IT, finance, and security teams improve cloud governance, strengthen security posture, ensure compliance and automate key tasks across Amazon Web Service (AWS), Microsoft Azure, and Google Cloud.